← Did you ever have to make up your mind? That’s the official motto of Toronto. “Diversity our Strength”. We love to brag about our it. The whole world, on our doorstep. You can see it wherever you go. Well, almost. You don’t really see it at City Hall. The corridors of power are still – in 2014 – dominated by white men. Here are some charts showing how bad the discrepancy is, between who we are and who leads us (below). Desmond Cole wrote a good piece about this today as well, check it out here. [Note, his numbers are a little different than mine.. I think because he only looked at the 44 Ward seats, and I included the full Council which is 45 seats]. One part of the problem is our voting system. There’s a tonne of data showing that voting systems have a huge impact on representation and diversity. Learn more at RaBIT, Unlock Democracy and Better Ballots! But to be honest, there is no simple solution. It’s a problem that is fueled by cultural barriers, media bias, voting systems, economic realities, and many other factors. The main thing, is to keep pointing it out. To ignore the lack of representation is to normalise it – and legitimise it. Only by raising awareness and speaking out, will we be able to spark some change. 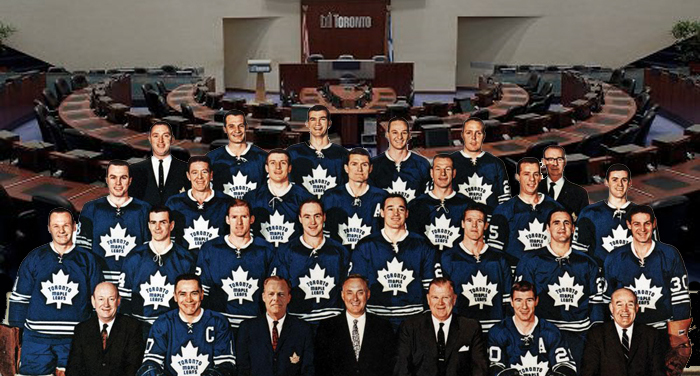 You know something’s wrong, when your City Council representing “The Most Diverse City in the World” …looks like a lot like the Maple Leafs. This entry was posted in Better Ballots, First-Past-the-Post is Evil, Random Rants. Bookmark the permalink.